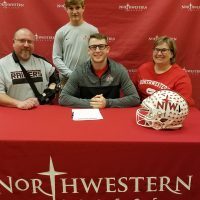 Isaiah Gilmore (Sioux City, Iowa) has signed a letter of intent to continue his football and wrestling careers at Northwestern College next fall. Gilmore is a 5’9”, 170-pound defensive back and long snapper who played three years for the Bishop Heelan High School football team. Gilmore helped lead the Crusaders to a 7-2 record last fall. An honor roll student, Gilmore plans to major in elementary education at Northwestern. A four-year letter winner in wrestling, Gilmore accumulated 99 career wins at Heelan, going 24-8 his senior year. Gilmore has also earned three letters in soccer for the Crusaders and is the son of David and Carrie.